A 63-year-old female patient without any systemic disease was referred to Gazi University Faculty of Dentistry for accurate identification of the lesion in the posterior left mandible. The lesion was observed on the panoramic radiograph taken in a private dental clinic that she had applied for routine dental treatment. The patient did not report any discomfort or tenderness. There was no pathological finding in her extraoral and intraoral examinations. On the panoramic radiograph of the patient, a radio-opaque area was observed in the near vicinity of the apex of the second premolar and a radiolucent area surrounding it [Figure 1]. Cone-beam computed tomography (CBCT) images were taken to evaluate the relationship with the adjacent anatomic structures. CBCT images were obtained with Promax 3D® (Planmeca, Helsinki, Finlandia) with exposure settings of 120 kV, 165 mA, and 39 s. On CBCT images, it was observed that the lesion was in close vicinity of the mandibular canal, the radiographic border of the lesion was ill-defined, and extended to the mandibular buccal and lingual cortices. The size of the lesion was approximately 16 mm × 20 mm × 18 mm. It caused perforation in the buccal bone [Figure 2]. In addition, it leaded the expansion of the alveolar bone both in buccal and lingual cortices [Figure 3]. Excision of the lesion was decided with the preliminary diagnosis of fibro-osseous lesion. Histopathological examination of the lesion, which was performed under local anesthesia, was carried out [Figure 4]. The lesion was diagnosed as FCOD after clinical, radiological, and histological examinations. Regular follow-up was considered. One year after the surgery a panoramic radiograph was taken and there was no sign of recurrence [Figure 5]. They most frequently appear on radiographs as opaque or lucent/opaque images with poorly-definable radiologic borders. One quarter of FCODs have definable outlines. 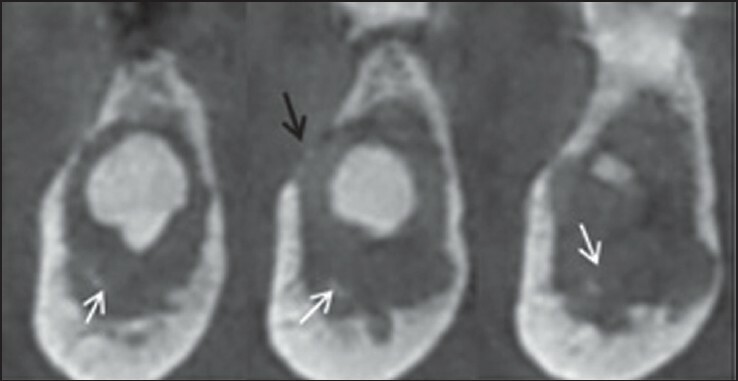 Radiologic images of FCOD change depending on the increase of mineralization. Well defined radiolucency can be observed in the early stage but it is not frequent. In the intermediate stage, mixed or full radiodensity with sclerotic borders is seen, and sometimes the characteristic radiolucent rim around the radio-opacity are observed. In this stage, semi-lucent no-rim poorly defined mixed radiodensity is observed in half of the cases. The last stage is more mature. 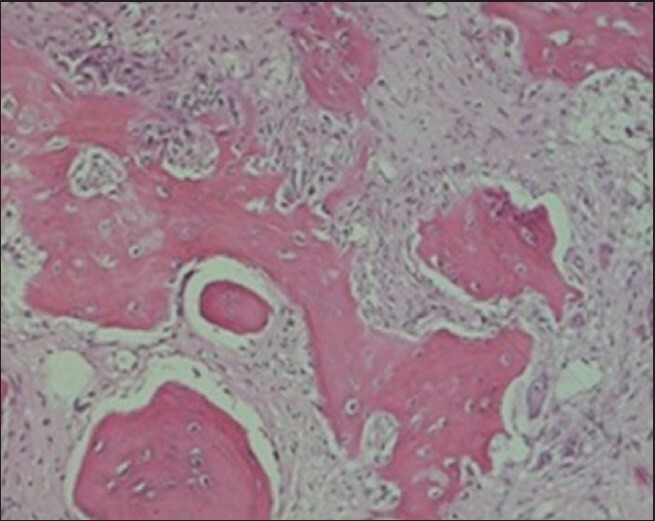 In this stage, a sclerotic radiodensity with poorly-defined borders is typical. The radio-opaque appearance of FCOD can be cotton wool-like irregular or diffuse. The radiologic features of present case are in accordance with the last stage; a poorly defined radio-opaque area surrounded by a radiolucent rim was observed. Additionally, cortical alveolar bone expansion and perforation are observed on CBCT images, which is possible only with tomographic images. 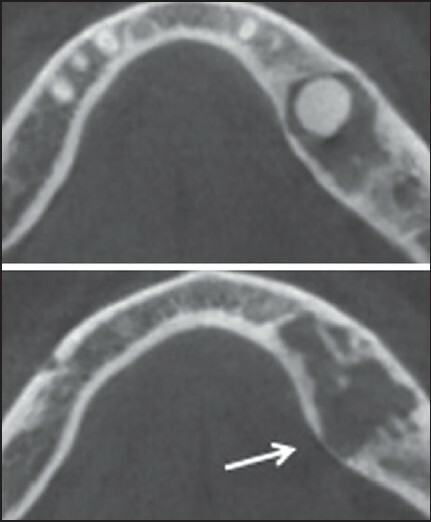 CBCT images may be preferable to observe the progression of the lesion. Diagnosis of FCODs must be based on the radiologic characteristics and clinical findings. The development stage of the lesion must be considered in the differential diagnosis. Periapical granuloma, cysts, and chronic osteomyelitis should be considered in the osteolytic stage of the lesion. Chronic sclerosing osteomyelitis, OF, odontoma and osteoblastoma should be considered in the mixed and radio-opaque stages. ,, In the present case, differential diagnosis from OF was critical as expansion and cortical perforation were observed on CBCT images. The final diagnosis was carried out with histopathologic examination. Focal cemento-osseous dysplasias do not require surgical intervention as they are benign and their growth is limited. It is recommended that these lesions should be followed regularly, because they can turn into fluoroid osseous dysplasia, which is the advanced form of dysplasia, or simple bony cysts can developed within the FCOD areas. , In present case, since the lesion had reached a large size and caused destruction of alveolar bone, surgical excision was decided and the patient was taken under regular follow-up. Although FCOD is generally asymptomatic and nonneoplastic, sometimes it can reach large sizes. It may cause expansion and/or perforation of the alveolar bone. In order to obtain detailed radiographic examination CBCT images can be considered more effective when compared to conventional methods such as panoramic radiography as CBCT images can provide three-dimensional examination. Care must be given for differentiation of FCOD, which is a reactive condition, from neoplastic and inflammatory conditions to prevent unnecessary surgical and/or endodontic treatments. Bulut EU, Acikgoz A, Ozan B, Zengin AZ, Gunhan O. Expansive focal cemento-osseous dysplasia. J Contemp Dent Pract 2012;13:115-8. Summerlin DJ, Tomich CE. Focal cemento-osseous dysplasia: A clinicopathologic study of 221 cases. Oral Surg Oral Med Oral Pathol 1994;78:611-20. Su L, Weathers DR, Waldron CA. Distinguishing features of focal cemento-osseous dysplasia and cemento-ossifying fibromas. II. A clinical and radiologic spectrum of 316 cases. Oral Surg Oral Med Oral Pathol Oral Radiol Endod 1997;84:540-9. Bhandari R, Sandhu SV, Bansal H, Behl R, Bhullar RK. Focal cemento-osseous dysplasia masquerading as a residual cyst. Contemp Clin Dent 2012;3:S60-2. Potochny EM, Huber AR. Focal osseous dysplasia. Head Neck Pathol 2011;5:265-7. Zegarelli EV, Kutscher AH, Napoli N, Iurono F, Hoffman P. The cementoma. A study of 230 patients with 435 cementomas. Oral Surg Oral Med Oral Pathol 1964;17:219-24. Young SK, Markowitz NR, Sullivan S, Seale TW, Hirschi R. Familial gigantiform cementoma: Classification and presentation of a large pedigree. Oral Surg Oral Med Oral Pathol 1989;68:740-7. Eversole R, Su L, ElMofty S. Benign fibro-osseous lesions of the craniofacial complex. A review. Head Neck Pathol 2008;2:177-202. Macdonald-Jankowski DS. Focal cemento-osseous dysplasia: A systematic review. Dentomaxillofac Radiol 2008;37:350-60. Forman GH. Periapical cemental dysplasia resembling apical granulomata and radicular cysts. Br Dent J 1975;138:22-4. Neville BW, Albenesius RJ. The prevalence of benign fibro-osseous lesions of periodontal ligament origin in black women: A radiographic survey. Oral Surg Oral Med Oral Pathol 1986;62:340-4. Natkin E. Zebra hunt. J Endod 1994;20:147. Su L, Weathers DR, Waldron CA. Distinguishing features of focal cemento-osseous dysplasias and cemento-ossifying fibromas: I. A pathologic spectrum of 316 cases. Oral Surg Oral Med Oral Pathol Oral Radiol Endod 1997;84:301-9. Brannon RB, Fowler CB. Benign fibro-osseous lesions: A review of current concepts. Adv Anat Pathol 2001;8:126-43.